It’s been a long time since I last made/decorated a Gingerbread house. This time I bought a Gingerbread House kit to save me some time fooling around with a template, and measuring and marking the doors, and windows myself. As it turned out this particular kit didn’t have the door or windows stamped on the Gingerbread so I ended up having to do that anyway. It also didn’t have enough icing. Next time I’ll make my own Royal Icing. Piping, icing, and working with fondant is challenging. I need a lot more practice, but it was fun watching the transformation from plain Gingerbread to the finished house, and I think my Gingerbread Christmas Trees look pretty good with the house, and next year I’ll make a couple taller trees too. This is adorable! I have never made one, so I am in awe. Thank you! 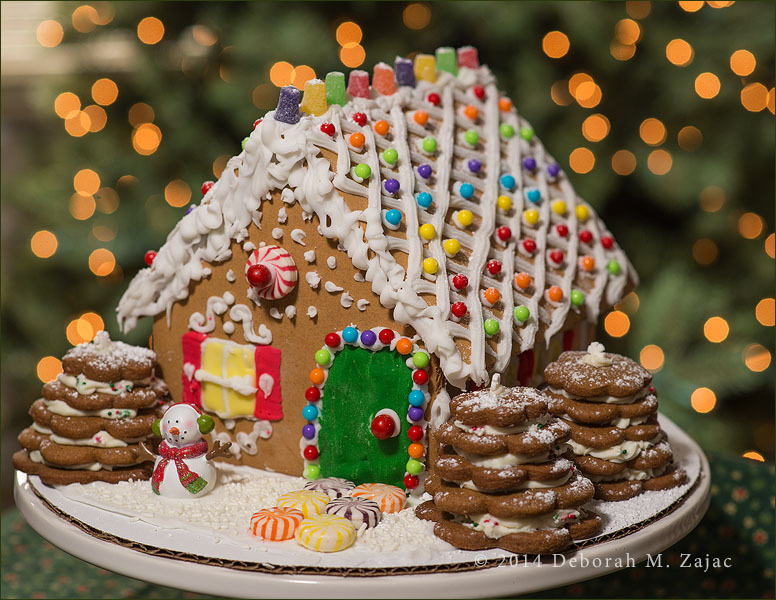 With a kit, and your artistic talent I know you would make an awesome Gingerbread House. That’s beautiful. We never made the attempt in our house. No, we were holiday shaped sugar cookies. Faith was in charge of decorating. Previous Previous post: News Flash! Woody Catches the Gingerbread Man! !